Activism in Australia has some characteristics that are different to other countries around the world. 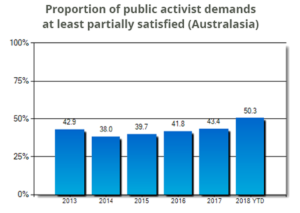 We examine the make-up of activist campaigns in Australia compared to the global average and unpick some of the recent trends to see if there is a pattern emerging. This article is an extract from a paper that will be released on 22 November at the AIRA Annual Conference in Sydney where FIRST Advisers is hosting a panel of three well known activists to get their views on activism in Australia. Has Activism Peaked or is it regrouping? 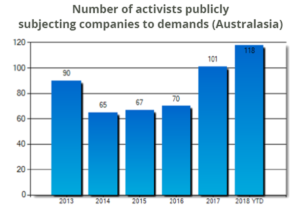 Globally the number of companies subject to activist demands has been falling for the past 3 years, from its peak of 887 in 2016, to 854 last year and, so far this year, to 811. Interestingly though, the number of activists has been rising, with 731 in the first 10 months of 2018 already exceeding the record of 714 in 2016. So, fewer companies globally are being targeted but more activists are out there hunting for opportunities. 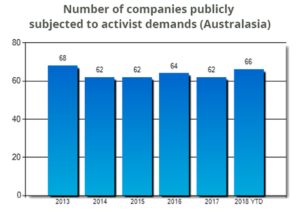 It’s not quite the same story in Australia where the number of companies subject to activist demands has been relatively steady since 2013, ranging between 62 and 68 each year. If things pick up in the remaining weeks of the year, as they seem to be doing, 2018 could record the highest number of activist campaigns in 5 years. Where Australia is consistent with the global trend however is the rising number of activists. As the chart below highlights this exploded last year, increasing by 44% and this year is on track to rise another 20%. For most of us this would come as a bit of a surprise. Apart from high profile activist campaigns targeted at companies in the top 100 -200, such as Elliott’s tilt at BHP, Ariadne’s campaign against Ardent Leisure and Premier Investments ongoing proding of Myer, most onlookers would be astonished to be told that Australia has the highest level of activism on the planet after the USA. Australian activists are good at what they do and they’re getting progressively better (50%) at having their demands met. By contrast in the US, where just over half of all global activism takes place, the success rate has been falling steadily for the past 6 years and now sits at 42%. This statistic may help to explain the speculation in recent years that US activists would start deploying their capital into regions outside the US. In 2018 there is some evidence that this has begun with parts of Europe and Asia, particularly France and Japan, subject to increased activism from the US. The first quarter of 2018 saw the largest amount invested by U.S. activists in European companies (US$5.4bn) in 5 years. So far Australia has remained immune from a US invasion despite its activist friendly legal and regulatory environment. However, as we have highlighted in previous presentations, the locals are getting more active and more sophisticated in how they approach activism. Institutional investors are increasingly open to provide the backing to a campaign and in some cases are prepared to step out from the shadows and take the lead themselves. This provides some, but not all of the explanation for why Australia is so activist oriented. We will expand on this more when we release our paper at the AIRA Conference and post it on our website on 22 November. In the meantime, keep in mind that companies should always be prepared for an activist encounter. developing an activist response manual which includes the contact details of key advisers that will form part of the campaign including legal, PR/ IR firms who specialise in activist situations and shareholder engagement firms.